In the summer of year 1560, Imagawa Yoshimoto decided to march east to Kyoto. On the way to the capital, he plan to desroy the Oda clan. Matsudaira Motoyasu (formerly Takechiyo) along with many Mikawa warriors was among Yoshimoto’s forces. The youthful Motoyasu, then only 17 years old encountered his first battles by successfully overrunning 2 Oda forts, Terabe Castle and Marune Castle. Imagawa Yoshimoto and his men were so confident of certain victory over the Oda clan that he and his warriors relaxed and enjoyed themselves after they camped at Okehazama. Imagawa Yoshimoto was unwise to celebrate before vanquishing the Oda clan. Unknown to Yoshimoto and his warriors, who numbered 20,000 to 30,000 men, Oda Nobunaga and his much smaller army of about 2,600 men stormed Imagawa’s camps during the stormy night. The Imagawa warriors were taken completely. Many of them were killed while they were drunken and having fun. Imagawa Yoshimoto thought his men were having a brawl and came out of his camp. Two of Oda’s warriors attacked Yoshimoto, who managed to injure one of them. The other samurai killed and decapitated Yoshimoto. When Imagawa’s warriors saw their leader dead, they panicked and fled. Matsudaira Motoyasu heard of Oda Nobunaga’s raid while he was in Marune Castle that he had brought down. When he was told to attack Oda’s forces, he was said to have stated he had done enough for the Imagawa clan. He had decided to throw his lot with Oda Nobunaga from then on. After securing the release of his wife and infant child, who were held hostage by the Imagawa clan, Motoyasu allied with Oda Nobunaga in an alliance that lasted until Nobanaga’s untimely demise. With the help of his retainers, the youthful Motoyasu consolidated control over the Mikawa province and much of Suruga province, which was formerly part of Imagawa’s domain. In 1564, while he was battling the warrior monks in his domain, he was shot but fortunately, he was unhurt as the bullet failed to penetrate his armour. In 1566, Matsudaira Motoyasu changed his name to Tokugawa Ieyasu. He claimed that he was descended from the ancient Minamoto clan. But the Matsudaira clan was so obscure that few people knew about their origin prior to the 15th century. It was possible that he concocted this to bring his clan to prominence. Tokugawa Ieyasu enjoyed much freedom in his domain. However, he was subjected to aid and serve the Oda clan from time to time. In 1568, Tokugawa’s men were ordered to march to Kyoto with Oda Nobunaga and his men when Shogun Ashikaga Yoshiaki requested Oda Nobunaga’s help to beef up his shogunate. In 1570, Asai Nagamasa, brother-in-law of Oda Nobunaga allied with the Asakura clan to oppose the Oda clan. The Asai and Asakura clan were aided by the warrior monks of Enryakuji, a magnificent monastery just outside Kyoto. The Tokugawa clan aided Oda Nobunaga to defeat the Asai and Asakura warriors. Enraged by the involvement of Enryakuji, Oda Nobunaga ordered his warriors to destroy Enryakuji and slaughter everyone on their path. Enryakuji and some nearby villages were burnt and destroyed. Both monks and lay people were brutally killed. 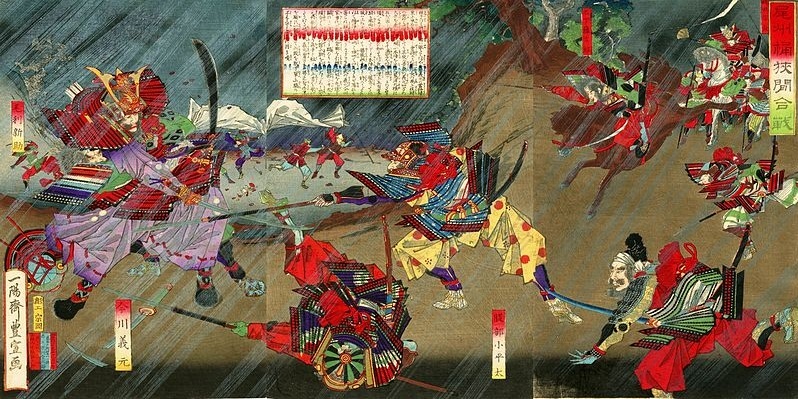 Ieyasu and many of Oda’s warriors were shocked but did not dare to protest Nobunaga’s cruelty.